Fall 2017 is officially here and so are new wedding trends. We’re saying goodbye to low-key neutrals and hello to bold color – among other trends. Read on to see what you might expect to see at weddings this fall. COLOR – As we mentioned, the past few years have been all about muted and neutral color palettes. In the last few months of 2017, brides are bringing the color. From what we’ve seen, we’re not just talking one accent color but more like a mix of 2-3 colors accompanied by lighting fixtures, full centerpieces and colorful wedding linens. DESTINATION – Couples are choosing between more guests and a wedding away. Limiting the guest list is now an even more popular reason to have a destination wedding. And yes – you guessed it – weddings are happening in more exciting places like Iceland and Italy. DIGITAL – Millennials have officially hit the getting-married age, which means wedding planning has evolved with technology. 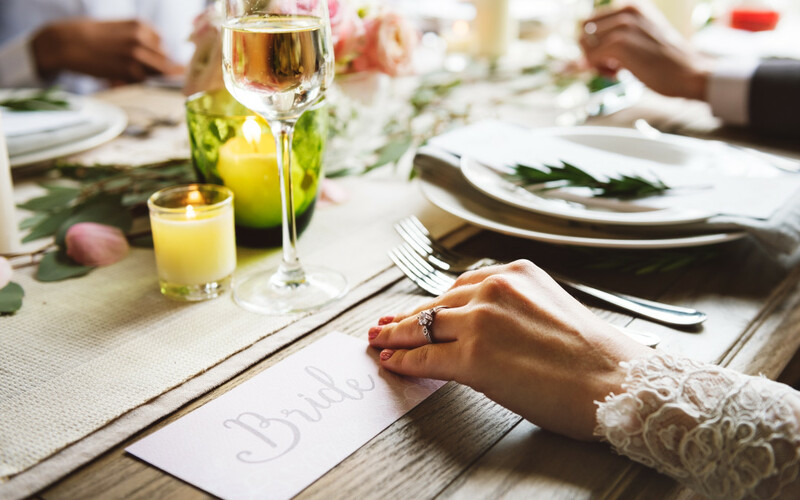 Virtual wedding planners are the new normal, complemented by wedding planning apps that give brides and grooms a sense of satisfaction at the touch of a button, instantly. RENTING – Benson Tent Rent has been providing wedding rental services for over 10 years but now more than ever, couples are turning to us for the best deals on wedding chairs, chic tents, beautiful linens and more. DROP – We love to see that a huge trend at weddings is centerpieces coming down from the ceiling. This is especially beautiful in our newest Sailcloth tents. Brides are also opting for floral arrangements that not only liven up the tables but also scale the walls and top of the wedding tents. FOOD – Couples hate making seating arrangements and guests kind of hate the awkward sit-down dinner. So, couples are shifting to a never ending a la carte option – cocktail apps, hors d’oeurves, buffet dinners, late night snacks and dessert. Lots of couples are even bringing in post-party food trucks! We can’t wait to see what our Fall weddings bring. What trends are you seeing? Let us know! What Makes Benson Tent Rent Stand Out From Other Rental Companies?